Engraved portrait depicting Allen Trimble of Hillsboro, Highland County, Ohio. Trimble finished Ethan A. Brown's term as Governor of Ohio in 1822 and then served two, full terms as Governor of Ohio from 1826 to 1830. Allen Trimble served as governor of Ohio during the first portion of the nineteenth century. Trimble was born on November 24, 1783, in Augusta County, Virginia. In 1784, Trimble's family moved to Lexington, Kentucky. His father, James Trimble, had received some land near Lexington for his service with the Virginia militia during the American Revolution. Allen Trimble attended school, but he did not pursue his education after the age of seventeen, probably due to his poor health. The Trimble family prospered in Kentucky. The family acquired slaves, but later became convinced of slavery's unjustness. Around 1800, James Trimble freed his slaves and prepared to move to the Northwest Territory, where slavery was prohibited. James Trimble died in 1803, leaving Allen as the family's main provider. Allen Trimble acquired property near Hillsboro, Ohio, and moved his family there in 1804. He spent the next several years as a farmer and, in his spare time, as a surveyor. In 1808, he became the Highland County clerk of courts and recorder of deeds. This position proved to be much more profitable for Trimble than farming. It also began his career in politics. During the War of 1812, he served as a colonel in the Ohio militia and led an expedition against American Indians residing in eastern Indiana. At the end of the war, Trimble used his popularity and reputation as a military officer to seek political office. Highland County voters elected Trimble to the Ohio House of Representatives in 1815. In 1817, the voters of Highland and Fayette Counties elected him to serve in the Ohio Senate. Between 1816 and 1826, Trimble's constituents selected him as their state senator five times. In each election, he defeated his opponents by sizable majorities. Trimble's fellow senators elected him Speaker of the Senate seven times. He was so popular that he was appointed as acting governor of Ohio in January 1822. Governor Ethan Allan Brown had stepped down to take a position in the United States Senate. Trimble served as governor until the end of Brown's term on December 28, 1822. Trimble sought the governor's seat in the election of 1822, but Jeremiah Morrow defeated him by a vote of 22,899 to 26,056. A third candidate, William W. Irwin, drew votes away from Trimble. In the election of 1824, Morrow once again defeated Trimble but the margin of victory, 39,526 votes for Morrow to 37,108 for Trimble, was much smaller. In this election, the two candidates agreed on the major issues, including support for a public school system and the construction of internal improvements such as canals and public roads. The voters possibly chose Morrow due to his previous experience as governor. In the election of 1826, Trimble won the governor's seat easily as Morrow was no longer a candidate. He won reelection in 1828. Politically, Trimble was a strong opponent of President Andrew Jackson and his policies. Jackson opposed the use of federal funds to build internal improvements. Jackson also was a slaveholder. Trimble was one of Ohio's most vocal opponents of Jackson. He also was opposed to many of the ideas of Jackson's Democratic Party. Trimble was a supporter of the Whig Party. This party originated in the 1830s in direct opposition to Jackson. Governor Trimble championed the need for public education. As acting governor in 1822, Trimble appointed a commission headed by Caleb Atwater. The committee's report became the basis for Ohio's public school system. The governor also called for the development of colleges in Ohio. Trimble helped improve Ohio's transportation system with his strong support of canals. While Trimble was governor, the first section of the Ohio and Erie Canal from Cleveland to Akron was completed. Between his terms as governor, Trimble served as one of the original members of the Canal Fund Commission. The commission's purpose was to find money to finance the building of canals. As governor, Trimble personally selected several of the sites where the canals would be built. Governor Trimble also faced complaints from white Ohioans about the growing number of free African Americans in the state. A supporter of the American Colonization Society, Trimble hoped to move freed African Americans in Ohio to Africa. Little came from his efforts, and the African American population continued to grow. Following his second full term as governor, Trimble retired from politics. He devoted the remainder of his life to farming. He became a breeder of horses and cattle, hoping to improve the quality of these animals. He also helped organize the Ohio Board of Agriculture and served as its first president from 1846 to 1848. His service with the Board of Agriculture shows that Trimble did not retire completely from public service following his stint as governor. 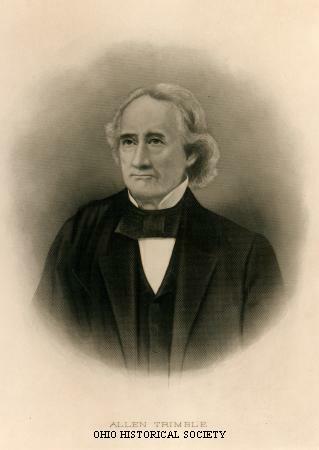 In 1830, Trimble had served as the Ohio State Temperance Society's original president. As this organization's leader, he called for laws limiting people's access to liquor. In 1850, Trimble ran for governor of Ohio once again as the American Party's candidate. He was defeated. Following this last political defeat, Trimble retired to his home in Hillsboro. He died on February 3, 1870. Thompson, Tuttle, and Henry B. Thompson, eds. Autobiography and Correspondence of Allen Trimble, Governor of Ohio, with Genealogy of the Family. Columbus, OH: N.p.,1909.